A while back, I had a conversation with an old classmate who has been working for the chip maker Intel. During our conversation, we talked extensively about the latest innovation in the world of chip making – the Intel Core Duo. I was thoroughly impressed by the chip’s specifications; the Core Duo greatly enhances computational performance and boosts the computer’s multitasking capabilities by twofold. This new technology made me thinking. If we could come up with technology to improve the computer’s multitasking, surely we can come up with ways to enhance the multitasking level of the human brain. The following is a simple brain training exercise that I think you will come to like. 1) To perform this exercise, you will need a piece of paper and two markers or pens. 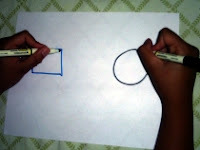 2) Draw a square with your left hand & a circle with your right hand. Do the two tasks simultaneously. No pausing or alternating. 3) Keep doing the same step until you are able to draw perfect square and circle. 4) Once you master the technique, do the same thing again but with both eyes closed. Additional exercise: Work with more complex shapes. This brain training exercise can either be a cakewalk or an impossible challenge. It all depends on how sharp your brain is, at the moment of the exercise. Try it at different times. Tell me what you think.